"With the bike weighing a fraction of its former self, Giorgio invested time into improving performance. The K1100 forks have been suitably rebuilt and the mono-shock swapped for an updated version. In place of the bulky airbox is a breather system that uses lightweight corrugated pipework. 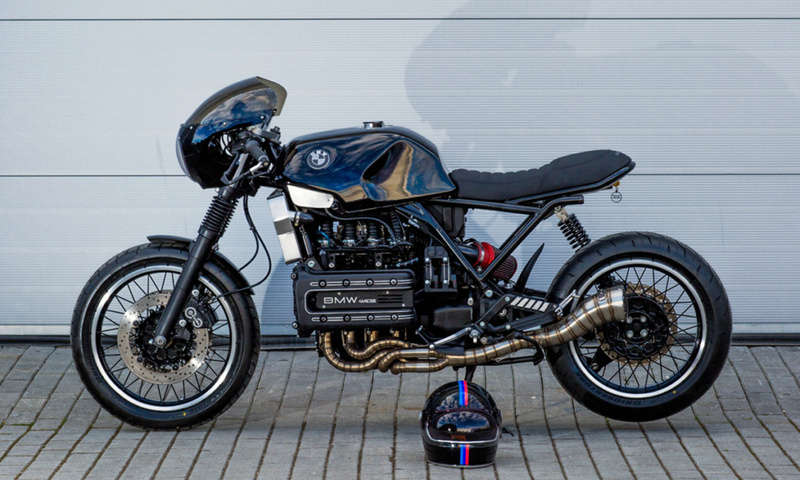 A large K&N cone filter positioned above the swingarm feeds each carb via the 1-into-4 system..."
"BMW Bricks have never been my thing, but..."
What credentials must one have to write this stuff?! @Two Wheels Better wrote: What credentials must one have to write this stuff?! A valid email address is the main one. The writer certainly neglected to indicate the clever adaptation of a EUR size 54 4E clown shoe for the seat; however, the term portly Beemers used to describe the K1100LT and RS is charming. I took a look at the Shahin build and then checked out the bike he referenced as an influence. Read that write up until I got to the link for the build that influenced that guy. I've seen that one and agree, a clean job. It has a mudguard up front! @Woodie wrote: I took a look at the Shahin build and then checked out the bike he referenced as an influence. Read that write up until I got to the link for the build that influenced that guy. The fuel injectors are now the 4-hole type, for better fuel atomization and smoother throttle response. I don't buy this. I've tried four hole injectors in both a K75 and a K1100 and they work the same as stock injectors. Same throttle response, same mileage. This is a big thing over on the Jeep forums and there's even a fancy YouTube. The one thing I've never seen is an actual dyno chart showing any difference. If the four holes made a tangible difference that could be documented on a dyno you know damned well that whoever is selling them would display it proudly. I'm not a doctor, although I play one on TV. Sure, a sprinkler beats a gurgling hose in disbursement of water onto your lawn, but in the end you get wet grass. A few Brickers have reported higher fuel consumption with the four hole injectors. And as .75 pointed out, due to their smaller size four hole would be more prone to blockages. And as per Duck I'm still waiting for the dyno comparison, which if they are so superior why wouldn't you show it by doing a dyno comparison. Most of the improvement comes from replacing dirty one hole injectors with clean four hole injectors. Most of the improvement comes from replacing dirty one hole injectors tired rubber brake hoses with clean four hole injectors anything new, including shiny braided stainless. Most of the improvement comes from replacing dirty one hole injectors tired shockers with clean four hole injectors anything at all. Most of the improvement comes from replacing dirty one hole injectors rusty fasteners with clean four hole injectors purple anodised bolts. Actually I'm not sure about the last one. I'm having my own conversation here. It's 5:20 am for me Chris. Thanks for a great start to my day! Don't mock purple anodized bolts. They do work. And I've seen the dyno charts that prove it. And who ever heard of purple anodised bolts that need shimming? !